I am always so thankful for great clients, and wedding party, that from the moment you meet them you know that your going to have the perfect day and that I can create amazing images for them. On this day I had the honor and privilege to photograph this fun wedding at The Daniel Island Club, located here on Daniel Island, Charleston, Sc, right down the street from me. 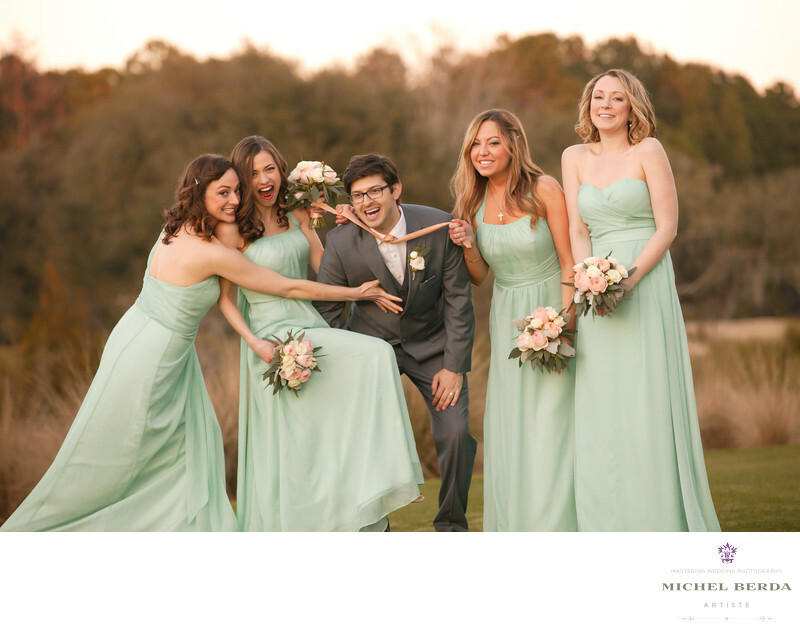 This venue The Daniel Island Club is the premier wedding locations in Charleston, Sc. They have a custom a one-of-a-kind-fair, for any weddings held there. It offers stunning marsh views, lots of greenery from the clubhouse, an excellent backdrop for those images, with a golf course, and elegant bridal room. This images was captured shortly after the ceremony, it came time to photograph the bridal party with the bride and groom. I usually will have a standard posed look first, then I always want to kick it up a notch and give my clients some fun images, thus creating in particular this one, is exactly why I am a wedding photographer, you can see the fun emotion in the image, you feel the groom being very happy, the bridesmaids with their great personality. You see weddings are joyful, and by being with them all day, you have to capture various personalities of everyone.Keywords: Charleston (1179), Charleston Sc (27), Daniel Island Club (6), Daniel Island Club Charleston (6), Daniel Island Club Wedding in Charleston Sc (6), Daniel Island Club Weddings (6), Destination Wedding Photographer (117), sc (309), Wedding (90), Wedding photographer In Charleston (27), Wedding Photographers (198), Wedding Photography (123), Weddings (168).